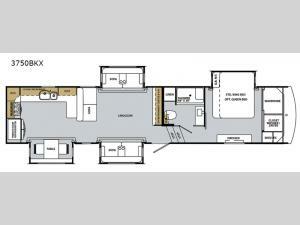 Camping in luxury can be fun and easy with this 3750BKX Cardinal Luxury fifth wheel by Forest River. It features a front private bedroom with a king-size Denver mattress, a wardrobe, a dresser, shelves, and a 32" HDTV for those nights when you just can't fall asleep, plus there is even a closet ready for the optional washer/dryer to be added. What better way to start your day than to enjoy a hot shower inside the 48" x 30" shower with a seat and skylight above. Inside the bathroom there is also a porcelain foot flush toilet, a vanity sink, and even a linen closet. The chef of your group is going to love cooking inside the rear kitchen and love the extra counter space even more!